As part of the initiative, each participant received a Lifestyle check which included tailored advice, motivational messages to encourage people to make positive changes to improve their health. They were also given a confidential Individual Health Passport which contained a record of their health results such as blood pressure, lung function testing etc. The hospital provided advice and guidance on diverse topics including initiatives to save money in terms of energy bills in the home, advice on cancer prevention and much more. The Marie Keating mobile was on site promoting their Bowel Screening campaign to help reduce the incidence of bowel cancer and they will accept bowel screen registration for those in the 60-69 years age bracket. The event was organised by the hospital’s Green Campus Committee. “We are very serious about our commitment to achieving the Green Campus award from An Taisce.” Stated Grainne McCann, General Manager Sligo University Hospital. “A green campus is a healthy site and to date only 1 hospital in Ireland has been awarded this distinction. This event and the benefit that we offer to our staff and service users is just one example of the ways in which we are committed to demonstrating long-term commitment to green campus status and works hand with other initiatives on site, including our smoke-free campus, paper coffee cup reduction initiative and the installation of new energy efficient boiler plant to heat the hospital". Many prizes were on offer including prizes for the best practical and implementable idea from a staff member to reduce energy or waste in the hospital. 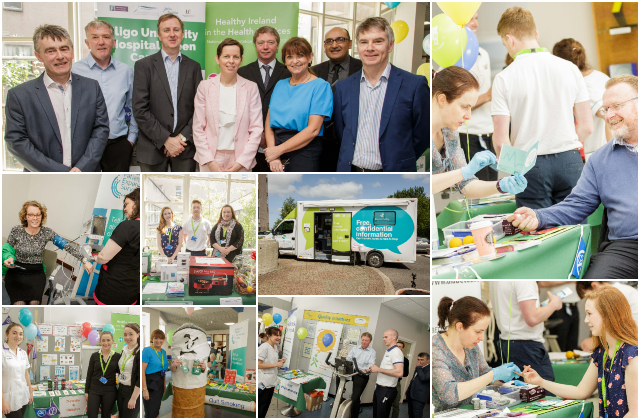 Exhibitors on the day included Kingspan Retrofit, Calor Gas, Sligo County Council in addition to the hospital team of specialists from Respiratory, Cardiology, Dietetics, Diabetic , Smoking Cessation and Physiotherapy Departments.